Despite the continuing Bear market and the sharp drop in prices of cryptocurrencies such as Bitcoin and Ether since the beginning of the year, market analysts at Sanford C. Bernstein & Co believe that the Bear market in 2018 is just a price correction. Regardless, cryptocurrency exchanges can double their revenues in 2018. According to a Bloomberg report, Sanford C. Bernstein & Co. analysts pointed to the massive revenues of cryptocurrency exchanges in 2018 and stated that cryptocurrencies are “the next big thing” for corporations due to the large profit margins. 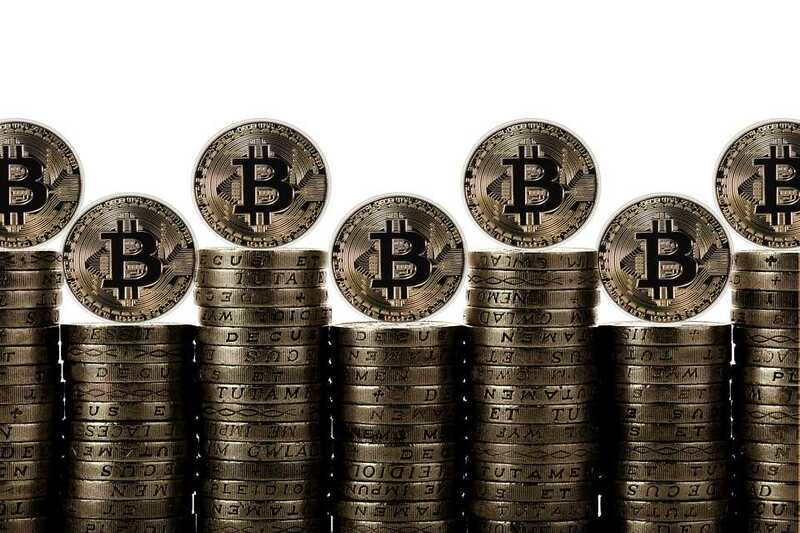 The purchase and sale of crypto-currencies, including Bitcoin, generated $1.8 billion in transaction fees on the largest cryptocurrency exchanges last year, or around 8% of sales on traditional exchanges, as per the observation of the analysts. In the segments, only global cash equities business outperformed crypto trading. Analysts also noted that, despite the collapse in cryptocurrency prices, cryptographic exchanges’ earnings in 2018 are expected to more than double to $4 billion in 2018. Just 1.8 billion dollars of it should be achieved by trading Bitcoin, which analysts call a lively trading market. An infographic created by Sanford C. Bernstein & Co shows that cryptocurrencies are still and still only a fraction of the traditional financial markets. 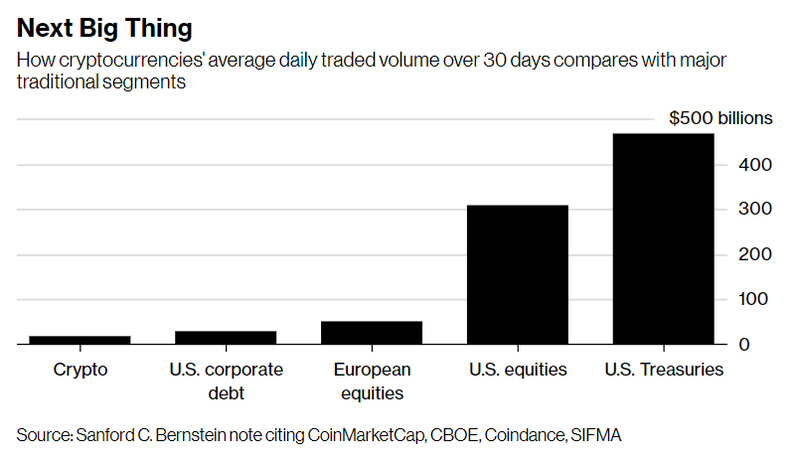 The daily traded volume for all digital assets averages to $17 billion, compared to $207 billion in the traditional US financial markets. Another comparison of the analysts further relativizes the trading volume of cryptocurrencies. While the total market capitalization of all cryptocurrencies is currently only $217 billion, the daily trading volume of the European stock market is significantly higher than all the capital in the crypto market, despite Bear market. For companies and cryptocurrency exchanges, the market is therefore extremely lucrative. As the market grows, there are plenty of opportunities for traditional companies, including “deposit solutions, asset management, and market-making services”. The Berstein report states that San Francisco-based Coinbase could end up with an “unassailable competitive position” if competition from traditional markets does not increase. The report estimates that Coinbase holds more than 50 percent of Bitcoin’s transactions. As we have reported, a large number of companies are currently in the process of establishing an infrastructure for cryptocurrency trading. While Goldman Sachs and Barclays have set up dedicated Bitcoin trading desks for clients, other banks are investigating custody services to protect customers’ digital assets, with the intention of charging attractive fees. Coinbase has introduced Coinbase Custody to keep cryptocurrencies safe for its customers. Ledger, Nomura, and Global Advisors have also announced plans to launch a project called Komainu to overcome barriers related to the entry for institutional investors and provide the best possible security for trading in digital assets. The CEO of Nasdaq has also been positive, stating that once the market is “mature,” cryptocurrencies could be traded on the largest US electronic stock exchange.